About a month after its iOS debut, the self-described “Twitter for audio” app Spreaker is now publicly launching Android. The app, which lets users broadcast live over the Internet, is a DIY broadcasting/podcasting solution with social sharing mechanisms built in. You connect the app to your Twitter and Facebook accounts to broadcast live as a status update. Afterwards, you can download the MP3 created to publish it as a proper podcast complete with music and sound effects. The Spreaker app is unique in that it streams audio in 128 kilobits and includes features like live chat and Skype call-in, in addition to social sharing. There’s also an online web platform that lets you edit the recording, insert sound effects and add background music from a library of pre-licensed content. The finished podcasts can then be downloaded as MP3 files or you can use the iTunes-compatible RSS feed to syndicate elsewhere. The freemium service offers two paid levels (Gold and Premium) starting at $19.90. These provide more storage, bandwidth and air time while also eliminating ads. The free version is monetized through Spreaker’s ad partners. Spreaker reminds me of an app I toyed with in the past, Cinchcast, which had the similar goals of democratizing access to podcasting. But Cinch has since gone B2B, with a heavy focus on business-level tools like analytics, while pitching its services as ideal for corporate communications, meetings and events, marketing, e-learning and the like. 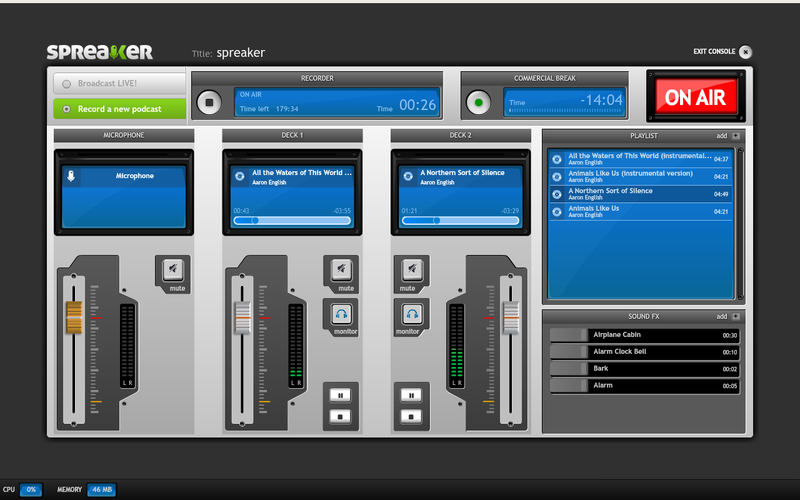 Spreaker, however, is meant to be a consumer-facing service. Podcasts, sadly, are often the forgotten child in the iTunes universe. They’re difficult to monetize for the average user in most cases, and that doesn’t get any easier when they have to compete with the production values of professional content creators. Maybe Spreaker can bring a renewed interest in podcasts. Or maybe no one really finds the average user’s thoughts all that compelling? The new Android app is available here.